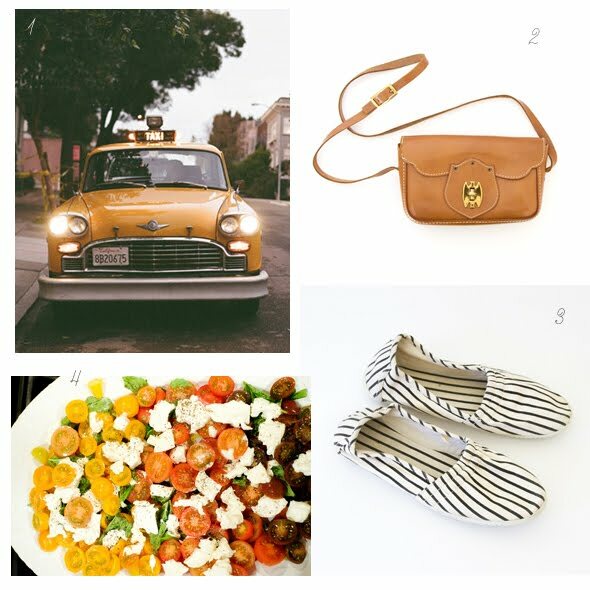 1. vintage getaway cab - kathryn's san francisco wedding. 2. shoulder bag for spring/summer - seesaw vintage. 3. striped slip-ons (comfy + cute) - seesaw vintage. 4. heirloom tomato salad (so good!) - the swell life. Oh, I am SO glad April is here! I just hope Michigan doesn't do anything crazy - like revert back to winter this month. woohoo-april!! love your roundup of images, perfect! have a great weekend! A perfectly curated selection of goodies to welcome one of the prettiest months of the year. Have a splendid weekend, Alli! SOoo crazy that these slip ons are in style now....my nanny wore them ALL the time! hah. Love it! LOVE the vintage cab! I'm all about the striped shoes this spring. Hooray for good months in a calendar! And I seriously can't believe that purse hasn't sold yet...so tempting. Have a great weekend! Love weekends and getting closer to summer too :) Great inspirations and links! This is such a great spring-like post. Those striped slip-ons are superb. i loved that san fran wedding on snipped & ink too. hope you had a great weekend! can't wait until heirloom tomatoes start popping up at the farmer's market! That heirloom tomato salad looks pretty amazing! those little stripey shoes are perfect for spring! lovely lovely! What could be better than a cute paper shop, a beautiful dress, and a gorgeous mansion! Love your blog!